Margaret O’Brien received a special Academy Juvenile Award for her work in Meet Me in St. Louis. 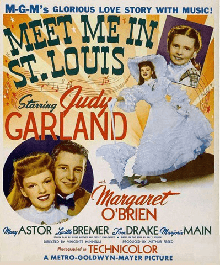 Meet Me in St Louis is an exuberant musical starring Judy Garland as Esther Smith, a 17 year old who has just fallen in love with John, the new boy next door. When Mr Smith announces that he has received a promotion and they moving to New York, his family is upset and unhappy at the thought of leaving St Louis and missing the 1904 St Louis World Fair. 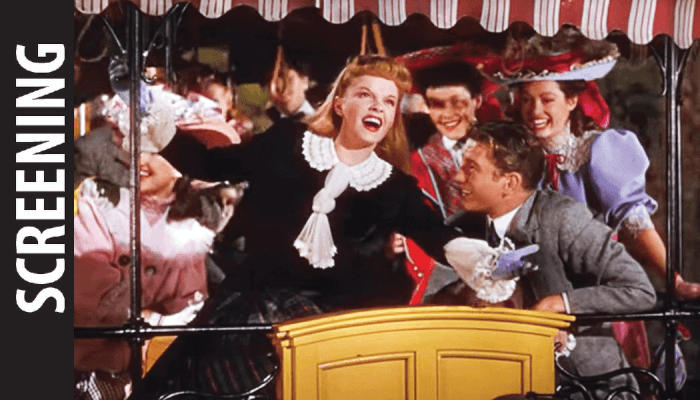 A number of hit songs came from this film, including Judy‘s jubilant rendition of The Trolley Song and Have Yourself a Merry Little Christmas which has become a Christmas standard. Director Vincent Minnelli embraced the new process off Technicolor, using the dazzling brightness of its colours to its fullest to create the now well known MGM musical look.